Hey, I have an idea! 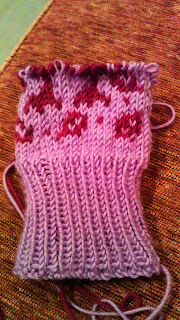 Why not jump straight in the deep end and learn colour knitting with a somewhat challenging owl mitten project? And how about not finding out exactly what a thumb gusset means before starting to follow the chart, surely that's a good idea too? So yeah, this is how far I got. It's not a completely horrible mess, but it is lumpy as hell, what with all the too tight floats at the backside. 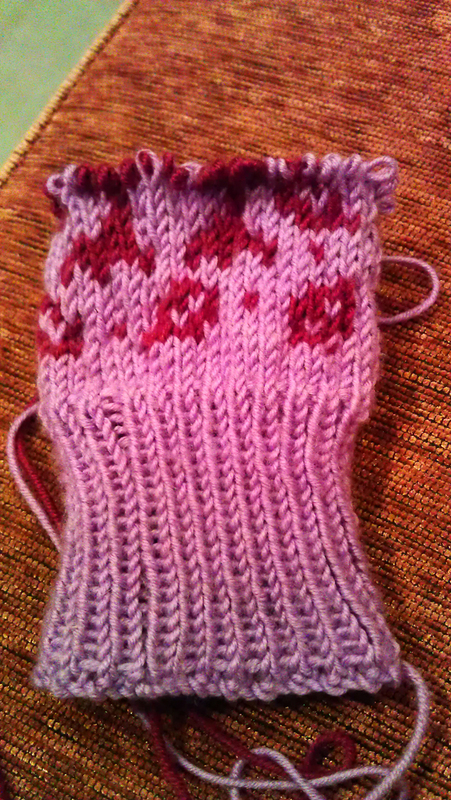 So I am secretly pleased that I totally ignored the instructions of starting to add stitches for the thumb gusset straight away... This way I had an excuse (or a reason even) to rip away and start again. I also spent half the night scouring YouTube and all kinds of knitting related sites to try and find out what I could do to stop the ugly puckering. No instant help was found, other than remembering to stretch out the stitches on the needles all the time (or trying to learn how to have one yarn on the right hand, English style, so that the tensions of the two yarns would be more even. After half an hour of trying to get at least some kind of tension going with my right hand and failing miserably, I gave up). I also found this video of a new type of way to hold the yarns in your left hand but couldn't for the life of me understand how she twists the yarn over in the beginning. 2 am might have had something do with the lack of brain function, so maybe I'll try again today. Ein sehr schönes Muster! Vielen Dank für den netten Kommentar!